Fully loaded with muti-pocketed cargo pants, logos, checks and unapologetically oversized coats, men have embraced colour as graphics and stripes keep them hooked. His geologist father based in Uttarakhand told him to finish his intensive four-year engineering degree even though Abhishek Paatni of Nought One was more esoteric in his choice of profession. 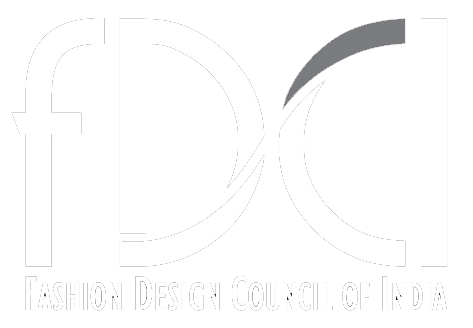 He pursued his MBA in marketing, but the recession in 2009, kind of took him by surprise leaving him with no other option, but to watch and learn how his sister Mansi, who works with Rohit Gandhi and Rahul Khanna managed a fashion business. That is how Paatni accidently got into design, with a bit of testing the waters with modelling, though from understanding circuit boards he turned his gaze on to sketching, which remained a fervent passion since school. Till today Paatni never works on moodboards, rather he is inspired by little things in life like Counter Strike, the game (the gilet in the line came from here), that’s why his approach to clothing is quite unique. For autumn-winter 2018, he was taken in by the simplicity of his grandfather’s 50s V-neck sweaters and he mixed that with his first love, street wear, a bit like when Supreme, a skater brand met Louis Vuitton. He believes that with environmental chaos, we will be forced to use whatever fabric is available to us, and may even need an oxygen mask to survive. That’s why you see all those extra pockets in Paatni’s ethos—maybe for chargers, oxygen cylinders, phones, food for an emergency. The Haldwani raised boy decided to custom make tabs for his line and added pouches (the new one rests on your waist and also on your chest!) and utility pockets. He has often repeated how he is futuristic in his design, imagining what it would be like to live in hostile climatic conditions. 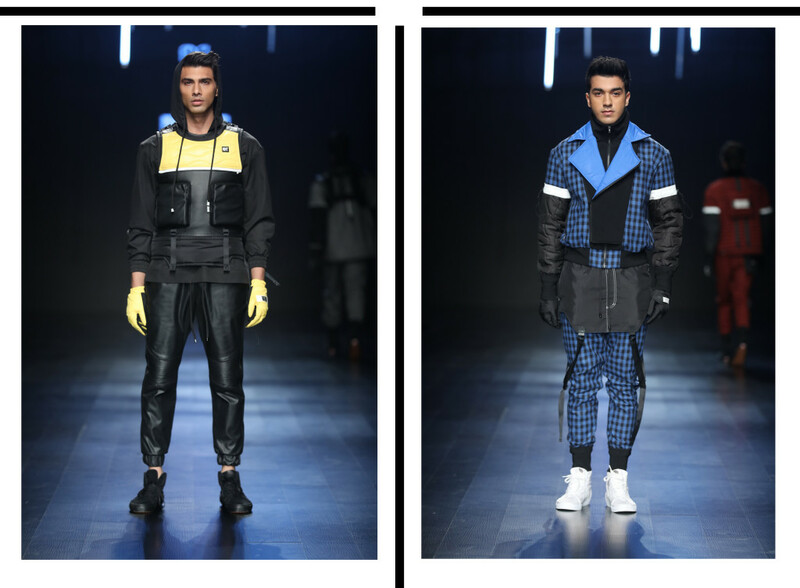 “Street Alpla” emblazoned on white hoodies, patchwork leather, ribbed knees, splashes of quilting in sky blues and yellow in unexpected places as well as extra sporty jogger pants made their way on to the catwalk. “Unfortunately men only experiment in the wedding zone in India and not in the lifestyle category, so we really need to build a culture of adventure, and the love for outdoors,” says Paatni, as he took a spirited sprint to take a bow on the runway. 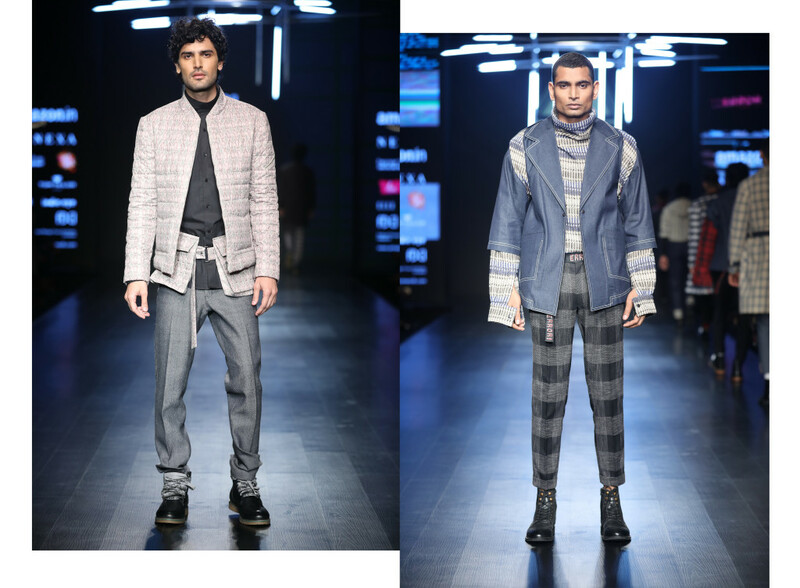 The menswear show with two others, Dhruv Vaish and Sahil Aneja gave a fleeting glimpse of what men are looking at when it comes to dressing. And it was clear that checks hadn’t lost their lustre neither had greys and blacks, as Dhruv from the legendary Ramsons store family introduced us to the magic of rolled up pants, printed bomber jackets, woolly turtlenecks, as well as padded coats with the ageless cable knit sweater. Dhruv in his quietness says a lot as he admits that his jackets are ideal for a cold winter as they are hand-made with Merino wool, woven in Kullu. The catwalks are awash with men in ponytails and beards. What is it with the love for excessive facial hair… what happened to clean faces and scrubbed homo sapiens? They have become as immutable as the side strap that has maintained its supremacy as a trend and comes sometimes sequinned, or red and in Sahil Aneja’s line…. checkered. Denim jackets with nautical pockets, the emergence of the rather long shirt, which women would wear as a dress has now made it to a man’s wardrobe, pushing androgyny. 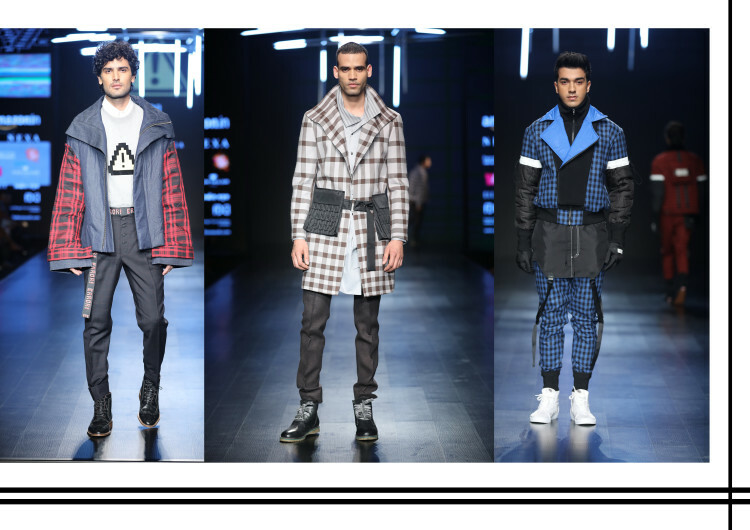 Sahil interestingly used glitch art, adding irreverence to the generally staid menswear category by “error” patched on to coats. “I just wanted to do something fun and wearable, and red was the strongest hue you could select from my line,” says Sahil.